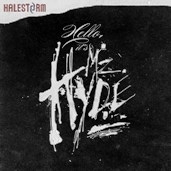 Fresh from their rip-roaring success on the Shinedown tour, Halestorm release this, their second EP, (the first being a selection of cover versions), containing no less than three tracks from their soon-to-be-released second studio album ‘A Strange Case Of…’ released later this year in the UK. The EP kicks off with ‘Love Bites (So Do I)’, a fast paced, raunchy rock’n’roller, similar in pace to Motley Crue at their best, with a curiously Sebastien Bach-esque vocal. Definitely the stand-out track from this issue. ‘Rock Show’ follows close behind, a totally different change of pace, but still nonetheless catchy. The beauty of it is its simplicity, plenty of hooks, riffs and even a tadge of loose rapping, but totally rock-show friendly, one of those songs that buzz around in your head for days after. ‘Daughters of Darkness’ picks up the pace again, with Lzzy Hale’s raunchy no-nonsense attitude pervading each and every word. Almost tribal, but still with Arejay Hales trademark riffology, this is a sure-fire live favourite, again with plenty of memorable moments to keep it rattling around your head. EP closer is ‘Here’s To Us’, a step down in tempo and as near to a ballad as you will get. With an almost ‘Here’s to the New Year’ feel to it, the song oozes sentimentality, sounding in places like old school Heart, and again, another great showcase for Lzzys powerhouse vocal. It’s a pretty safe bet to assume that the tracks on this EP are representative of the rest of the album, this being the case then the ‘The Strange Case Of….’ will be a contender for album of the year in many pundits eyes. I, for one, will be watching with interest.